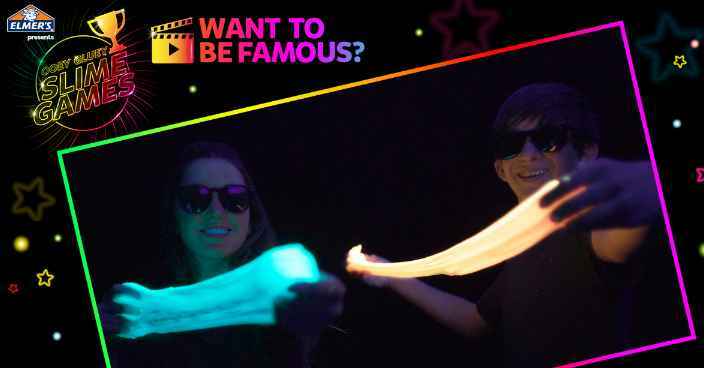 Want to be famous? if so, then enter the Elmer’s Ooey Gluey Slime Games Contest right now at elmersslimegames.com for your chance to be a star in Nichole Jacklyne’s next slime video, win a year’s supply of Elmer’s Clear Liquid Glue (5-fl. oz. ), a year’s supply of Elmer’s Liquid Glitter Glue 6-fl. oz, Cash Prize, Wi-Fi Tablet and tons of other amazing prizes. During the contest period visit this link: https://elmersslimegames.com to enter. Once you visited above link now click on the “Start Now” button and enter your date of birth ( Entrants who are between six (6) and twelve (12) years of age (a “Minor Child”) must have their parent/legal guardian enter on their behalf. Now Follow the on screen instructions to register by entering all information requested on the registration form in order to enter or vote. Prizes: One grand prize winner will win a $3,000 Cash Prize,a year’s supply of Elmer’s Clear Liquid Glue (5-fl. oz. ), a year’s supply of Elmer’s Liquid Glitter Glue (6-fl. oz. ; First Prize (1 per Category, 6 total for the Contest Period):Each First Prize Winner will receive a “First Prize” package consisting of: a check made payable to the First Prize Winner in the amount of USD $1,000,a 126 GB Wi-Fi tablet,30 bottles Elmer’s Clear Liquid Glue(5-fl. oz. ); Second Prize (1 per Category, 6 total for the Contest Period):Each Second Prize Winner will receive a “Second Prize” package consisting of:30 bottles Elmer’s Clear Liquid Glue(5-fl. oz. ),30 bottles Elmer’s Glue Slime Magical Liquid Activator Solution(8.75 fl. oz. ); Third Prize (1 per Category, 6 total for the Contest Period):Each Third Prize Winner will receive a year’s supply of Elmer’s Glow In The Dark Glue (52 5-fl. oz. bottles, color determined by Sponsor in its sole discretion) (“Third Prize”). The ARV of each Third Prize is $436.28. ARV of all prizes is: $23,769.04. Who Can Enter: The contest is open only to legal residents of the fifty (50) United States and District of Columbia who are six (06) years of age or older at the time they enter the contest. When To Enter: The Elmer’s Ooey Gluey Slime Games Contest entry begins on July 9, 2018, at 12:00 PM Eastern Time (“ET”) and ends on September 30, 2018, at 11:59:59 PM ET. Who’s Sponsor: The Elmers Slime Contest is sponsored by Newell Office Brands, 6655 Peachtree Dunwoody Road, Atlanta, GA 30328.